Tri-Color and Two-Tone Gold, what are they? A recent email from one of our visitors asked me to explain what "Tri-Color Gold" means (as in our Flower Hoop Earrings shown here), and it occurred to me that a lot of folks may wonder about that, as well as "Two-Tone Gold". So here is an overview of what these terms mean--but first, an overview of gold colors. Pure 24K gold is of course a beautiful deep gold-yellow color. But, pure gold is too soft to be used in solid form for most kinds of jewelry--for instance, a ring made of pure gold would be too soft to hold up under continued wear on your finger. It would easily get squashed and scratched in everyday use. 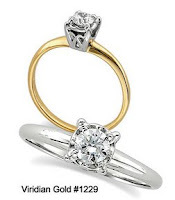 In addition, with pure gold trading at around $900 to $1,000 per ounce (the highest prices in history), pure gold jewelry is too expensive for most folks. All gold jewelry is therefore mixed with other metals to make it stronger and more economical--mixing metals together is called "alloying". When alloyed, the deep yellow of pure gold can be changed to other colors, depending on the type of metals used in the alloy. So, when pure gold is non-alloyed, it is called 24K gold, meaning it is 100% gold. 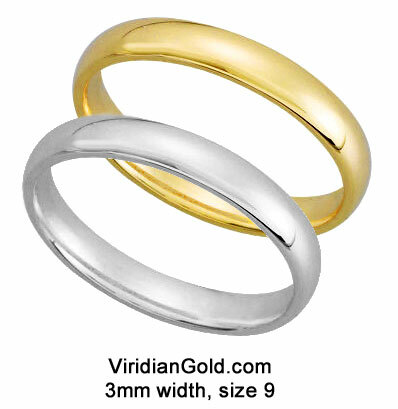 Mixed with other metals, it becomes 18K gold (75% pure gold) or 14K gold (58.5% gold). The percentage of gold is called "fineness", and is often written as 750 (for 18K or 75%) or 585 (for 14K or 58.5%). The alloy metals used to make 14K and 18K yellow gold are typically silver and copper, and to make white gold, copper and aluminum, as well as iron, are used. But other colors are possible, such as the now popular "rose" or "pink" gold--this color is made by using more copper than in the yellow gold color. Green gold is also possible by adjusting the ratio of copper and silver in the alloy. So, when three of these gold colors are used in a single jewelry item, it is called "Tri-Color" gold, and this usually means yellow, white and rose. The individual colors are present in individually-made pieces of the jewelry item. 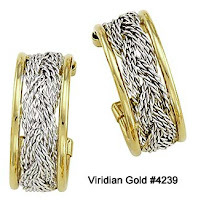 For "Two-Tone Gold", the colors are usually yellow and white, such as in our Hand Woven Hoop Earrings shown here. 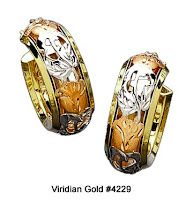 Either way, you can be assured that when you buy gold jewelry from Viridian Gold, you are getting solid gold jewelry--we do not sell gold-plated items--and all of our jewelry is marked with its fineness, such as 14K or 18K, which is your assurance of quality!